A Plymouth University lecturer is delivering solar cookers to Zambia to empower communities and help them to cook as sustainably as possible. Dr Karen Treasure, Associate Lecturer in International Relations, is travelling to the African country in January to help local people – many of whom survive on as little as £1 per day – to use the cookers and not to rely on trees from their forests for fuel. She also wants to enable locals to drink clean water, by boiling it on the cookers before drinking, as 35 per cent of the country relies on unimproved water sources. The model of solar cooker she is taking boils a litre of water in eight minutes, and is made of robust steel, making it both effective and low-maintenance. Dr Treasure’s desire to deliver the solar cookers was born from her continued research on development and social justice in sub-Saharan Africa. Her PhD in 2007-2008 considered the concept of empowerment and how it is utilised in the context of international aid to Zambia. 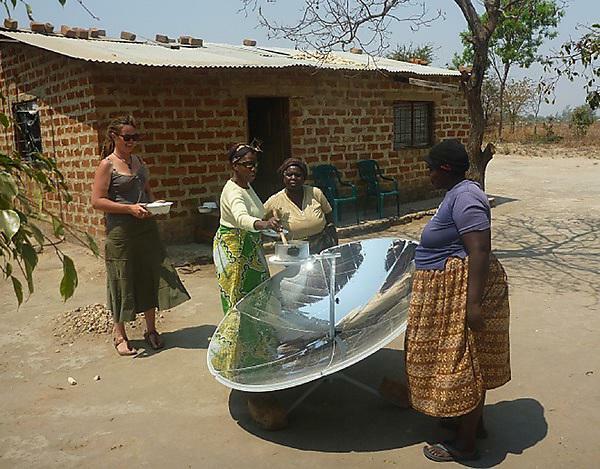 She has since visited Zambia for fieldwork on a range of issues connected to community level development and, having seen first-hand the positive effects of a solar cooker, is keen to deliver many more of the devices. Parabolic solar cookers harness solar power by simply reflecting and focusing the sun's rays to a spot in the centre, where there is a stand for a saucepan. They also come with insulated food bags, which can keep food hot and as good as fresh for several hours. This enables families to cook on the cooker in the heat of the day and eat the food in the cool of the evening. “I am due to visit the country in January because it’s vital that solar cookers are distributed sooner rather than later. Zambia continues to lose close to 1 per cent of its forest cover per annum, or around 300,000 hectares - between 1990 and 2005, Zambia lost 14.3 per cent of its forests. Dr Treasure has set up a Crowdfunder page to help her fund 20 solar cookers in total.